Working for change pays off. Here's how to break through psychological barriers. 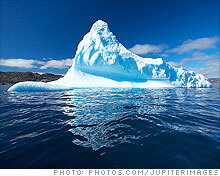 Think of memory as an iceberg: The visible tip is what you can remember. (Fortune Small Business) -- Have you ever tried to lose weight or quit smoking? Or been chided to listen better or to be more patient? Maybe you're thinking you'd boost business if you exhibited greater confidence, assertiveness or agility, or made clearer, faster decisions, or weren't so irritable. No question, there's plenty of upside to making some adjustments. But changing an ingrained pattern, whether behavioral or emotional, is one of life's greatest challenges. Entrepreneurs like to think they eat obstacles for breakfast, and there's no shortage of gurus and pundits dishing out self-improvement advice. But real change is still very hard. As anyone knows who has ever made a resolution only to break it days later, it's easy to backslide. So how does change click, and how can you make it stick? While I acknowledge that these questions have a thousand answers, here are some of the key areas I focus on with many of my clients. The first hurdle is a reluctance to address matters related to emotions and behavior. If your computer, car or air conditioner isn't performing optimally, you probably won't waffle on having it checked. But in working with entrepreneurs, I find that they tend to be more reluctant than most people to acknowledge emotional issues and ask for help. The most typical reasons that I've encountered are the fear of feeling weak and the fear of being seen as vulnerable. Both are tough to defeat -- so don't. Instead, take these uncomfortable feelings as stage one in a complex project that will require strength and commitment to complete. We often work against ourselves to keep things static, even when we want them to move. In most cases today's emotional impasse started as a legitimate coping device shaped by the innumerable factors of nature and nurture (birth order, innate disposition, parents' personalities, major events and catastrophes and so on). The instinct to survive takes many forms. One child might learn to be quiet and restrained so as not to ignite a volatile father. Another could learn how to be "up" to counter a depressive mother. While some of these adaptational maneuvers work better than others in practice, they are frequently marvels of innovation. Problems tend to come later, when we cling to those early strategies even though times and circumstances have changed -- repeating contradictory behavior, remaking poor decisions and applying old and often inappropriate solutions to new problems. The son of an angry father might grow up to be a calm businessman who keeps hiring rantaholics. He may think the past is past, but he's actually still engaging the beast (his dad). Rationality holds little sway over these deeply embedded patterns, and you can't just yank them away. In order to change the pattern, you must first understand its original purpose and function. Think of memory as an iceberg: The visible tip is what you can remember. But what is hidden is not forgotten. It lies beneath the surface, operating outside of awareness -- until something happens to remind you of it (such as finding yourself at the precise place you've worked to avoid or becoming repetitively stuck or stymied). Until you understand the meaning of these buried experiences, they will always take you by surprise -- perhaps in the happy form of inspiration or, less constructively, as an impediment or a constriction. You're busy managing your business, working to stay ahead of the recessionary typhoon. Why should you think about any of this? Because successful leaders look for every competitive edge. And being emotionally in tune -- resilient, agile, aware -- is an unmatchable advantage. Revise any prejudice against emotional inquiry. Accept the fact that fear, rigidity and avoidance are corrosive -- and that reaching an understanding about yourself can reap rewards. Admire psychological complexity; don't let it intimidate you. Decode your mind to harness its natural ingenuity. Respect the gargantuan force of your emotional life. Emotions can propel you to success. They can also impede and even straitjacket you. No matter what, you can't ignore your emotions and still hope to prosper in business or in life. Alexander Stein, Ph.D., is a business psychoanalyst in New York City and a principal in the Boswell Group and Triad Consulting.